Have some spare money to spend on high-tech toys this holiday? How about a mirror? A talking mirror? 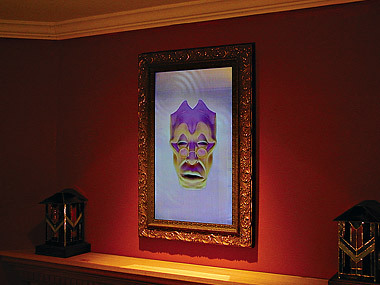 This mirror, invented by Hollywood special-effects expert Craig Barr and named one of the Best Toy Inventions of 2006 by the Time Magazine, is not an ordinary mirror that we would hang in our bathroom or in the hallway. When integrated with your home security system (got one?) and actived, Basil, the guy on the mirror, will show up and warn you, for example, when your survalence camera picked up a stranger approaching your house.